Convertkit: The system I use to send my newsletters. I switched from Mailchimp to Convertkit a while ago and I’m still loving it! Organize & Automate: This is the course I launched this month. 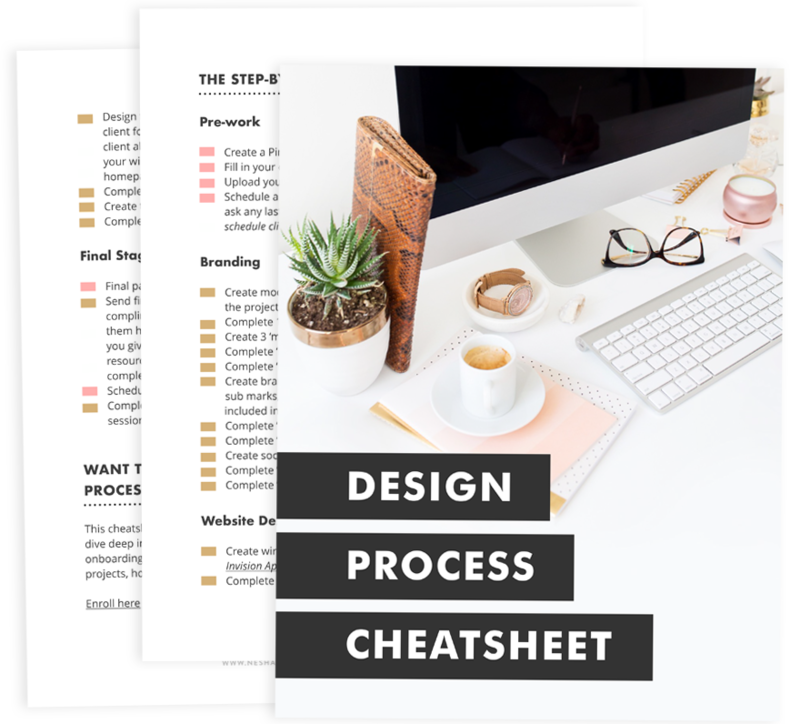 If you’re a designer and you’re interested in streamlining your design process, I welcome you to check it out! Webinar Rockstar: I learned everything I needed to know about hosting webinars from this course. It’s aaaaamazing. How to set up a webinar for free using Squarespace. Course Launch Collateral: Mariah wrote an amazing post on all the things you need to make before launching your course. One of the things I tried to do this month to grow my website traffic was direct my newsletter subscribers to my site. Instead of emailing them the full blog post, I send them the start of the post then linked to the full article so that they would need to click through to my blog to read it. In all honesty, I’ve never liked formatting my emails this way but this month I wanted to give it a try. It’s a good way of getting email subscribers to not only click through to my blog, but also look around the rest of my website. Another thing I tried was Promoted Pins. I got 79 clicks through to my website after spending £3 of my promoted pin for 6 days. I don’t think that’s too bad considering the pin was really specific and wouldn’t interest everyone. I’m looking forward to playing around with promoted pins in the future! I can see this being a great way for me to reach new people and grow my community. My newsletter has started to grow quite quickly, without my putting too much emphasis on it. I don’t have pop-ups or slide-in op ins on my website, and there are only two opt-ins on my homepage. So I’m really happy with my newsletter growth considering I could do with putting more emphasis on it. One thing that has been a big difference to my opt-in rate is changing my lead magnet (opt-in freebie) often. Halfway through the month, I changed my lead lament from a checklist of tools to a design process cheatsheet, and I noticed a big spurt of new opt-ins. Now all of your website visitors will be interested in your main lead magnet, so make sure you change it up every now and then or have multiple opt-ins on your website. I’m going to be deleting inactive subscribers at the end of next month, so look out for a drop in my numbers! I secretly can’t wait- I’ll take high-quality subscribers over a high quantity of them any day. I’m guessing you want to hear how the launch of Organize & Automate went, right? Let’s jump into it! I built up a pre-launch list of people who were interested in O&A. To do that, I created an opt-in freebie and added it to a landing page on my website. Then anyone who opted in from that page were tagged in Convertkit as ‘Interested in O&A’. By the time my launch came around, I had 1767 subscribers on my launch list, ready to hear more about O&A. For the rest of the month, I made another 45 individual sales. During the webinar I hosted about streamlining your design process, I made another 29 sales. That resulted in $11,613 in sales from the prelaunch of Organize & Automate. I learned this month that courses take a lot of work to create, but they sell a lot easier than ebooks because people value courses more (and rightly so). I won’t launch another course until next year, but I’m definitely going to. I like the fact that I can help lots of other designers with my courses, whereas one-on-one training only helps one person. Prepare my business for 3 months off. I can’t believe it but I’m having 3 months off!! November to January. Technically, I won’t be completely off work because I’ll still be on social media, answering emails, coaching and maybe even hosting a webinar or two. But I won’t be taking on any design work and I won’t be launching anything. To prepare for this time off, I’m going to use July to record and schedule all she lancer content, newsletters and blog posts. I’m going to get everything sorted well ahead of time so that I can stress less when November comes around and I get ready to live in Central America. Social Pilot. I switched from Buffer to Social Pilot so that I don’t have to pay $10 a month just to schedule Facebook posts. Buffer would only let me schedule 4 weeks into the future on their free plan, but Social Pilot’s free plan has a lot more flexibility. Nothing. I know it’s strange to say I’m not obsessing over any other tools, books or courses right now but that’s because I decided to cut myself off from other people’s products, blogs and newsletters. I unsubscribed from every newsletter except my three favorites, I deleted Periscope from my phone, I stopped going through people’s tweets… I cut myself off from the rest of the internet so I could focus on my own stuff. And it’s amazing. I’ve realized that when I do this, I feel happier and I can concentrate on creating more. If you feel a little overwhelmed by the craziness that is the internet, do the same. Take a break. I promise it will do you good. Should you launch a course? Launching a course is an amazing experience and it can grow your business like crazy. But launching courses isn’t a business model that suits everyone! Before you create your own course, listen to this audio lesson to see if it’s the right direction to take your business in. Can I spare 2-3 months from client work so I can focus on creating this course? Will my course launch bring in the income I’ll lose out on because of NOT taking on clients for three months? Do I WANT to work this hard? Or am I just thinking of launching a course because everyone else is doing it?